The Hobbit: The Battle of the Five Armies, directed by Peter Jackson and starring Martian Freeman and Ian McKellen is the last installment of The Hobbit series. The story picks up where The Desolation of Smaug leaves off as Thorin and the dwarves make an attempt to reclaim their mountain home. The dragon Smaug retreats from the mountain in an effort to wreak havoc upon the people of Laketown. Determined to save his home and his family Bard takes matters into his own hands along with his young son to defeat the dragon. While the people of Laketown seek refuge and the remaining dwarves along with Tauriel try to escape the burning town, Bard defeats Smaug with a single shot from a steel spear. Bard reunites with his family and the people of Laketown make their way to the Lonely Mountain in order to find a new home. Meanwhile Thorin settles into being a king, but is possessed by the power of his gold. Bard tries to make him share some of his gold in exchange for their alliance so that his people can start to rebuild their lives, but Thorin refuses. Thorin is still in search of the Arkenstone and makes his fellow dwarves look for it. Bilbo finds the stone but keeps it a secret from Thorin with the belief that he will lose himself even more once he has the stone. Now that the dragon Smaug is dead, he is no longer a threat, and with Thorin not in his right mind, the neighboring races of Middle Earth make their way to the Lonely Mountain to take it and the riches inside. The armies march to the mountain and Bilbo makes a deal to trade the Arkenstone to the Elvin king Thranduil in hopes that Thorin will fight to defend his lands. 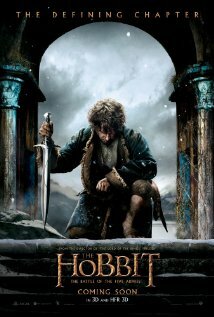 The plan backfires and Bilbo is back where he started as he tries to save Thorin from himself. Thorin eventually finds the strength to overcome his greed and starts to embrace the honorable man that he truly is. The battle of good and evil is on as the forces of darkness try to overcome good, but in the end goodness prevails with a cost. Thorin and the Orc general fight to the death, while Kili dies trying to protect his unclaimed love—Tauriel. Bilbo says his goodbye’s as he makes his way back to The Shire with a very powerful ring that he believes is kept a secret. The Battle of the Five Armies was a great movie. Jackson did a great job with telling the story, and putting the pieces together and setting the stage for what’s to come in The Lord of The Rings. Even though fans a very familiar with the characters old and new alike, it was nice to see how they each were developed and took shape. Throughout the entire Hobbit series, I made mental notes and referred back to events that occurred in The Lord of the Rings. I really liked how Gandalf, Saruman, and Galadriel’s involvement in the story really evolved. I even appreciated Legolas’ back story, when it came to how he became a loner in the first LOTR film. The story was very cohesive and well done. The special effects and Score did not disappoint and the overall tone of the film has a very enthusiastic vibe. It’s hard to say goodbye to a story that has impacted fans on such a personal level. The energy behind this project is really historically and creativity epic and I don’t think that any other movie series could ever top it. The cast was wonderful, the visual representation opened up all the senses of imagination and stimulated parts of yourself that only a creative imagination can dream up. I gave the Hobbit 5 stars and am looking forward to seeing the entire series in order from beginning to end.